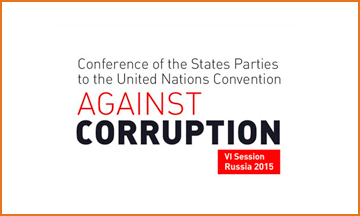 2 — 6 November 2015, the Sixth session of the Conference of the States parties to the UN Convention against corruption St. Petersburg. 2 November 2015 at the exhibition complex "Lenexpo" took place the solemn opening of the sixth session of the Conference of the States parties to the UN Convention against corruption. The ceremony was attended by more than 1,500 representatives of 160 States parties to the UN Convention against corruption, including more than 60 heads of anti-corruption agencies of countries of the world. The company "Auto Management" organized transportation services for conference participants. Meeting at the airport, delivery of participants to the conference venue, hotels in. - minivans Mercedes Sprinter and others.